Raleigh, NC, is a great mix of history and modern life. The capital of North Carolina, Raleigh is its second-largest city, part of the Raleigh-Durham-Chapel Hill Triangle. If you’re thinking of moving to Raleigh, you’ll want to check out some of these great neighborhoods. There something for everyone in this great city—visit Raleigh and check it out for yourself. Raleigh’s first designated historic district, Oakwood is a true 19th-century neighborhood that’s fun to walk in, even if you decide to live elsewhere. Oakwood began to develop east of downtown after the Civil War, and grew through the 1920s, with a variety of historic architecture including elegant Victorians and cozy bungalows. Many houses have been restored. Because it’s near downtown, many of Raleigh’s movers and shakers live in Oakwood. An Oakwood preservation society conducts candlelight tours as well as other neighborhood activities. This North Raleigh development began in 1977 and is composed of modest single-family homes and townhouses from the early ’80s and later. The community is close and hosts a supper club, bridge club and book club. Seven Oaks Swim & Racquet Club serves residents. Stonehenge is popular with two-income families who work at Research Triangle Park or in Raleigh. Nearby retirement communities include The Cypress of Raleigh, Abbotswood at Stonehenge and Springmoor. This section of northwest Raleigh is centrally located and convenient to Research Triangle Park. It’s a reasonable commute to Durham or Raleigh, and there are lots of shopping options. Since the ’90s, thousands of homes and condos have sprouted up in Brier Creek, along with offices, shops and amenities. Brier Creek Country Club is home to an Arnold Palmer-designed golf course, a swimming pool with lap lanes, and clay tennis courts. Close to interstates 40 and 540, Brier Creek is convenient—but it’s still in Wake County, home to what many consider to be the area’s best schools. Five Points is named for the intersection of Glenwood Avenue, Fairview Road, Whitaker Mill Road and Glenn Avenue. This walkable neighborhood is northwest of downtown, so there’s an urban feel to it. The big intersection has bars, restaurants, boutiques and an independent movie theater. Shops and restaurants mix with homes. Five Points streets are lined with trees but downtown and North Raleigh are right next door. To the west of the intersection, the upscale Hayes Barton neighborhood enjoys 90-year-old homes with big porches. To the north are Bloomsbury and Vanguard Park, with modest bungalows and cottages. To the east are Roanoke Park and Georgetown, with older houses undergoing renovation and some new construction, too. North Hills was once a distant suburb, but lately has been called “Midtown.” That’s because it’s on the edge of both old Raleigh to the south and new subdivisions to the north. Ranch houses surround North Hills, a walkable open shopping mall, in the neighborhood near I-440 and Six Forks Road. On the edge of North Hills, new subdivisions are popping up. Ramblewood is a community with townhouses, flats and garden homes with hefty price tags. A retirement community, The Cardinal, is under construction. Hillsborough is highly rated in Raleigh for its walkability. Just a little west of downtown Raleigh, you can complete most errands on foot there. There’s lots of shopping and dining, including Cameron Village Shopping Center. This is the home of North Carolina State University, so there’s a high student population, but Hillsborough is a safer neighborhood and the cost of living is excellent. Mordecai is named for the family plantation it was built on following World War I. It’s among the oldest neighborhoods in the city. Mordecai House, built in 1785, is the oldest house in Raleigh still in its original location. Other historic landmarks in the area include St. Marks Chapel, the Bager-Iredell Office, and the birthplace of Andrew Johnson, 17th president of the United States. Mordecai is a walkable neighborhood with two public schools. At Few Moves Moving Company, we’d love to be a part of moving your family into your favorite Raleigh NC neighborhood. 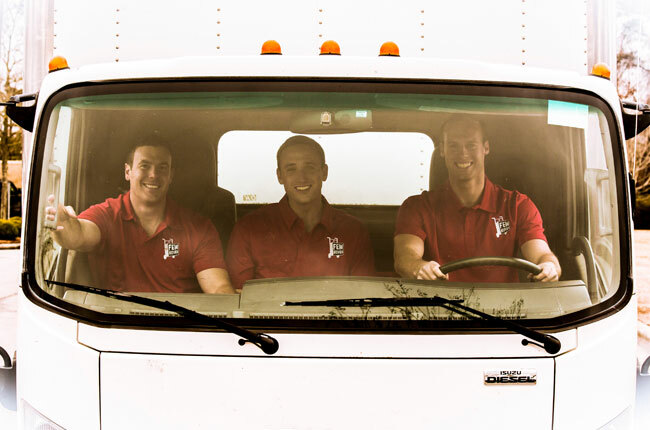 We’re licensed, insured, and employ highly trained professional movers. Call and ask us about your move at 919-999-6201 or request your free estimate!